Do you have fond memories of Bugs Bunny chasing Elmer Fudd around an opera house, or anywhere else? If so, you’ll probably enjoy Boston Lyric Opera’s “Barber of Seville.” The story is simple, at its heart a commedia dell’arte stock plot in which young lovers and a tricksy servant outwit a rich old jerk, and the new production, directed by Rosetta Cucchi, presents Rossini’s beloved opera in what looks like the collision of an M.C. Escher drawing and Disney’s “Alice in Wonderland.” It skimps on neither singing nor slapstick nor staircase chases, all supported by a sprightly orchestra led by music director David Angus. Come prepared to laugh. 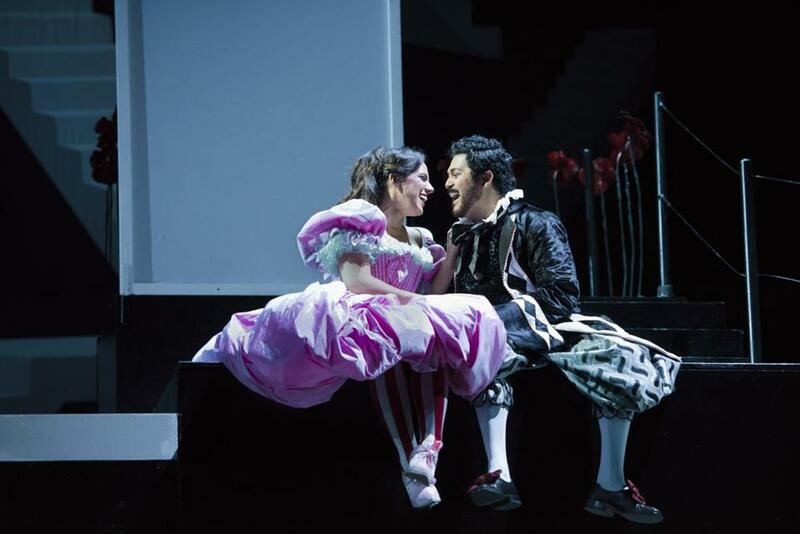 Cucchi has previously directed a 1960s Parisian “La Bohème” and a metatheatrical “The Marriage of Figaro” for the BLO, and with this “Barber” she has found directorial equilibrium. Julia Noulin-Mérat’s revolving tower sets pleased the eye and ear as well, providing acoustically advantageous perches for singers. D.M. Wood’s outré lighting and Gianluca Falaschi’s ornate, cartoonish costumes never distracted from the action, instead amplifying it. The heavily stylized production and clever staging (as well as the cast’s dedicated clowning) contributed amusement and momentum to sequences that can sometimes be repetitive. This production doesn’t just tinker with design, but also focuses on giving the women additional self-determination. When the domineering Don Bartolo locks up his ward Rosina (here, forcing her into a literal cage too small for her cumbersome balloon skirt) and gloats in song, she stages her own jailbreak as soon as the old fool’s back is turned with a defiant recitative that is often cut. Instead of the harried housekeeper Berta visibly lamenting her old-maid status and wishing for death, the end of her aria is here surtitled as “No one seems to want me! I feel like I could explode,” while she feather-dusts the pantalooned rear ends of a quartet of footmen. In that last case, the action may have been enough to convince the audience that she didn’t really mean what she was singing. Mezzo-soprano Daniela Mack is making her company debut as a kicky Rosina, treating the audience to a dusky, round low range and fiery vocal runs on Sunday. As Count Almaviva, Jesus Garcia was on fire from the beginning, unleashing beautifully ardent paeans to Rosina in his elegant voice and throwing himself wholly into his various disguises as drunken soldier and obsequious music teacher. The two made adorable onstage lovers, and the addition of Lady Gaga’s “Bad Romance” as vocal exercise during their singing-lesson scene was a funny update. Garcia sounded distinctly winded by the finale, and this production omits the notoriously difficult tenor showpiece “Cessa di più resistere,” probably a wise choice given all those stairs he has to climb. Starting at the end of the overture, when he appeared grinning in his barber’s chair upstage center, Matthew Worth’s Figaro was presented as a bravado-filled mastermind, but he didn’t immediately sing like one. His “Largo al factotum” sounded thin, and he separated from the orchestra’s tempo a few times. His voice warmed up more after intermission, matching his consistently on-point comic timing, and he and Garcia were easy compatriots. An opera buffa’s nothing without buffoons. Steven Condy has proven his puffed-up prowess many times as Bartolo (he sang the role in BLO’s last “Barber,” in 2012) and it was such fun to watch him zip through tongue-twisting patter and fall victim to all manner of pranks. Michelle Trainor’s Berta was a comedic and vocal treat, as was David Crawford’s deliciously shifty Don Basilio, who was dressed like Marilyn Manson at a Renaissance Faire and lit with haunted-house green whenever he appeared. These three added distinct droll touches to their deliveries, but they never veered into true grotesquerie; Rossini’s melodies always carried the day.